Destination Chiba – Tokyo’s Playground. 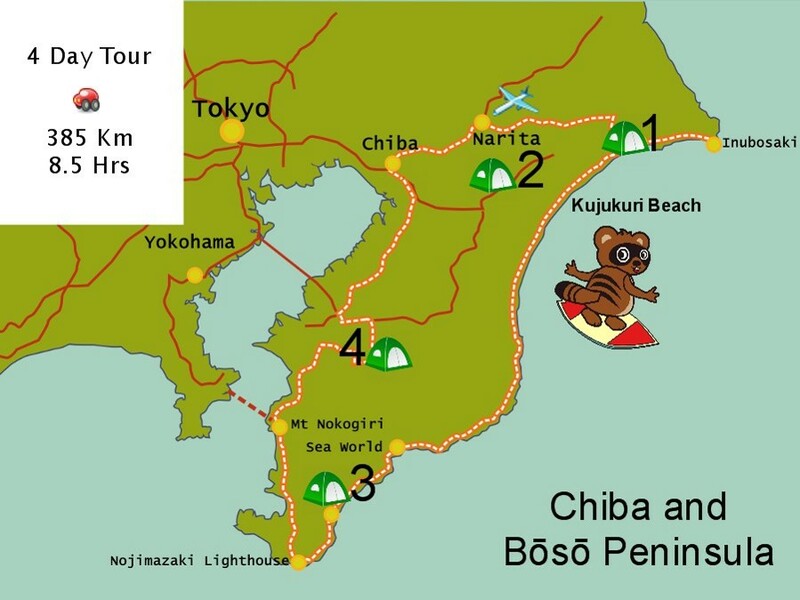 Chiba prefecture is known for it’s fishing, farm produce and long sandy beaches. Best of all it is also the home of Narita International Airport and gateway to Tokyo. A great place to start your camper adventure in Japan! Find more attractions on the official travel guide . Day 1. Start at our Tomisato office near Narita Airport. Drive 1 hr to Kujukuri Hama a 66 km long beach that is popular for fishing and surfing. Visit Cape Inubo-saki and lighthouse on the eastern most point in mainland Japan. Day 2. Cruise along the coastline, surf beaches and further south through sleepy fishing village coves. Visit Kamogawa Sea World Aquarium. Day 3. Drive through flower and market gardens and further south to Cape Nojimazaki Lighthouse. Then head north to Mt Nokogiri famous for its cable way and ancient Buddhist shrine. From the top you can see Tokyo Bay and Mt Fuji. Day 4. Return to the office. There is no rush as it is only 2 hour drive. Bōsō Hanto and Kujukuri have many camping options, parking lots are very busy during summer months and you will have to pay to stay. But during off season it is relaxed and you can park for free. There are Michi no Eki (Parking Stations) which offer free overnight parking and toilet facility. Bathing can be done at the many Onsen ( Hot Spring Bath ) in the region.